Engagement season is upon us and that means wedding planning is not far behind! If you’re on the hunt for unique wedding venues in Orange County, Costa Mesa has everything from barn-chic to Country Club classics and plenty of options for your out of town guests. 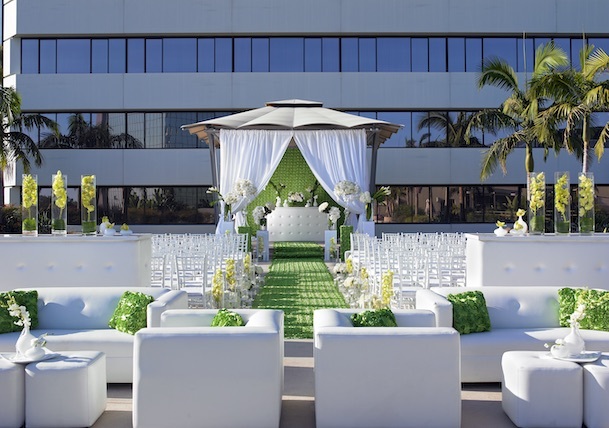 With a diverse range of venues, ease of access to freeways, hotels for every budget (and room blocks to match) and a buzzing community of wedding creatives, Costa Mesa is the perfect location for your wedding day. Perhaps one of the most surprising wedding venues in urban Costa Mesa, Centennial Farm is the perfect fit for a rustic barn wedding without the fuss of traveling to the country. The working farm’s Millennium Barn is available for rental throughout the year and includes access to much of its picture-perfect outdoor space and garden. Minimalists will love a ceremony in California Scenario, more commonly known as Noguchi Garden. The unique outdoor sculpture garden includes more than 7,000 square feet of open space and installations by famed Japanese American artist Isamu Noguchi. Desert streams, towering trees, granite formations and indigenous plants serve as the backdrop for a peaceful ceremony. Both ceremony and reception are coordinated by Mastro’s Steakhouse, just adjacent to the garden. Accommodates up to 110 guests. A new addition to Costa Mesa’s event spaces, The Harper is a flexible creative venue with both indoor and outdoor spaces perfect for a contemporary and romantic wedding day. Hold your ceremony in the European inspired courtyard under olive trees before heading inside for an airy, open reception. The site also offers separate bride and groom lounges, a bar and private gardens. Accommodates up to 300 guests. The modern and luxurious Avenue of the Arts is aa six-time “best of weddings” pick on The Knot.com. Say “I do” lakeside or in the property’s luscious garden retreat, take advantage of plenty of stunning photo backdrops on site, and enjoy a modern ballroom for receptions. Avenue of the Arts’ wedding specialists help tailor each celebration to fit every unique couple’s vision and ensure the day runs smoothly. Accommodates up to 200+ guests. Transport your guests to a cobblestone village square with an outdoor ceremony at the Ayres Hotel & Suites. 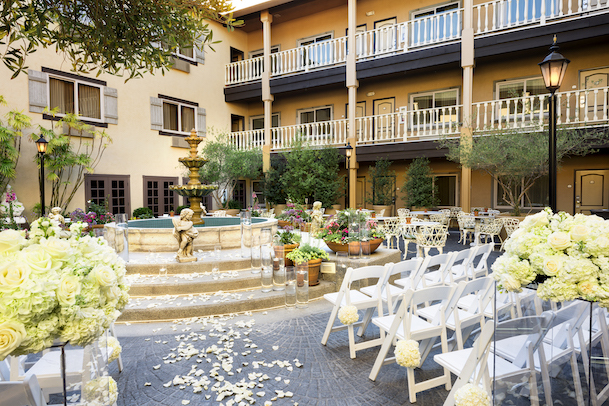 The hotel’s courtyard, complete with fountain and European inspired architecture and landscaping, is perfect for an intimate and romantic wedding. Catering is provided by the popular Le Chateau Restaurant, located inside the hotel, and includes customizable menus. The hotel’s staff offers prompt and reliable assistance throughout the planning process. With 7,000 square feet of open floor plan, Fete the Venue can be adapted to match the vision and needs of nearly any couple. The venue inspires a modern, industrial feeling and includes a 3,500 square foot outdoor courtyard, indoor bar, catering prep and kitchen areas, and a bridal salon and grooms lounge to relax in before the ceremony. Accommodates up to 400 guests, depending on location of ceremony. Luxury and attention to detail are key to every wedding at The Westin South Coast Plaza. 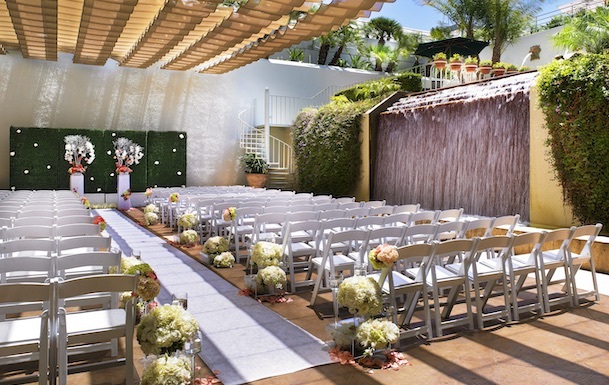 Intimate ceremonies can be held in front of the hotel’s cascading Waterfall Terrace while larger ceremonies can be planned for the hotel’s picturesque gazebo or pavilion surrounded by palm trees. No matter which location, the Westin South Coast Plaza’s event spaces can be transformed to fit the most extravagant visions by the hotel’s well-experienced staff. Accommodates up to 900 guests. As one of the largest event venues in town, Hilton Costa Mesa is ideal for large weddings and multi-day affairs. While ceremony space can be found both indoors and out, the hotel’s ballrooms offer the most space, accommodating up to 1,200 guests. Weddings with 50 to 400 guests can enjoy access to the outdoor Garden Terrace to take advantage of the Southern California sunshine. Accommodates up to 1,200 guests. Segerstrom Center for the Arts isn’t just one of the country’s premier performing arts theaters, it’s also a stunning backdrop for a wedding day. The center rents out a number of the theaters and spaces on the property, so there are plenty of styles and layout to choose from. The most visually stunning, though, is perhaps the breathtaking glass walled Renee and Henry Segerstrom Concert Hall circular lobby where you’ll be surrounded by loved ones as your vows are shared. Plan your wedding against the backdrop of the stunning Mesa Verde Country Club for a classic fairytale celebration. While it remains one of the premier private clubs in the area, Mesa Verde is open to all for weddings and events. The course’s wedding garden on the 18th hole serves as a stunning ceremony backdrop, while receptions are held in the spacious ballroom with plenty of views of the course below. Accommodates up to 225 guests.